Marc by Marc Jacobs champions loud prints, snappy slogans and a smart use of colour, reminding style fans that fashion can have a sense of humor. The diffusion line, which launched in 2001, is made with care-free, cool and contemporary women in mind. Much-like Marc Jacobs, Marc by Marc Jacobs focuses on flattering retro cuts and vintage-inspired quirks but this collection has a much more modern, easy-to-style feel. From clothing to jewellery and shoes, Marc by Marc Jacobs offers a complete wardrobe of cleverly updated classics. 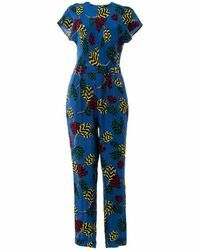 This collection of women's Marc by Marc Jacobs jumpsuits includes denim boiler suits, beach-ready playsuits and slinky, embellished evening styles.